Task coloring by Projects is a good and visual way to determine which Tasks are connected to Projects. Your taskbars or Gantt charts can also be colored using Task colors, Task Data Fields or Project Data Fields. To color your Gantt charts by Project colors, you must choose colors for your Projects first. 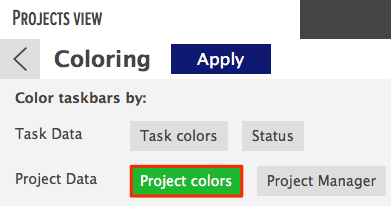 You can do that in the Project dialog when creating the Project or just choose a color later. You can save the coloring option to the view or change it back from the same dialog. 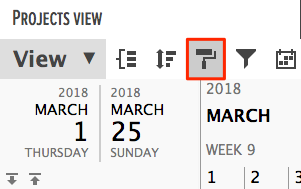 You can create Custom Views using different grouping, coloring, and filtering options. For example, create a view where Resources are grouped by Projects and the Gantt charts are colored by Project colors to have a better overview of your Project portfolio. Did not find the answer to your question regarding coloring tasks by projects?